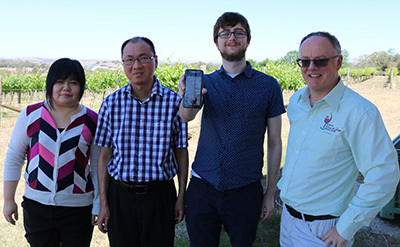 The WineOz Smart Grape Android app was developed by Charles Sturt University (CSU) researchers (pictured left) and is available for growers and vineyard managers to use this coming harvest. Lead researcher and NWGIC Director, Professor Leigh Schmidtke (pictured on right with the research team), said, “This smartphone app allows growers to quickly measure and then chart the colour and size of the berries. 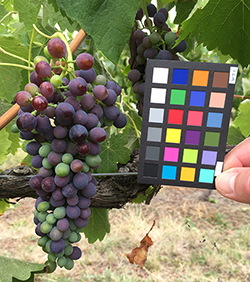 “The app will make it easier for grapegrowers and winemakers to use objective measures – proven for Australian conditions – to determine the optimum fruit picking ‘window’ to suit desired wine styles by tracking the evolution of fruit colour (white varieties) or volume (for red and white varieties)”, Dr Waters said. Read more about the Wine Australia funded project here. Information on Wine Australia’s research program can be obtained from Hannah Bentley (Hannah.bentley@wineaustralia or 0428 930 865). Top photo shows the CSU grape app research team (left to right): Dr Jasmine Seng, Dr Ken Ang, Mr Alex Oczkowski, and Professor Leigh Schmidtke.